The conserved miRNAs are key players for post-transcriptional control of gene expression for plant growth and development. The overexpression of miR408 is reported to show improvement in biomass and photosynthesis in Oryza sativa. Also, microarray data show differential expression in somatic and regenerating embryos of japonica rice. 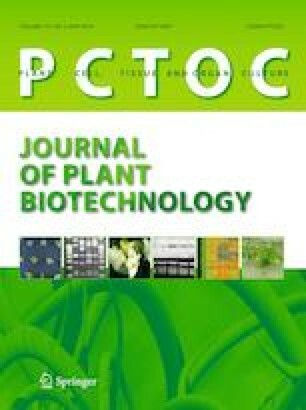 The position weight matrix analyses of miR408 (72 sequences) family in plant kingdom was performed using DAMBE and targets were obtained by psRNATarget. The qRT-PCR experiments were performed using stem-loop primers to evaluate the role of miR408-3p and targets in seven different indica rice varieties, the formation of regenerating pluripotent somatic embryos and assessment of suitable conditions for generation of somatic embryos. Different callus induction media and regeneration media, healthy calli, brown calli and necrotic calli were also used to assess the expression of miR408-3p and its targets. The conserved sequence of miR408-3p was observed and 68 targets were identified using psRNATarget in Oryza sativa. The qRT-PCR was performed on target Uclacyanin which shows mismatch at position 14 and 15, and RNA polymerase II at position 14 and 17. The miR408-3p expression shows recalcitrant > moderately recalcitrant > non-recalcitrant in indica rice variety. Significant differences in the expression of miR408-3p for the developing somatic embryos at 10-day, 15-day, 20-day, 25-day and 30-day old somatic embryos were observed. Evidences for miR408-3p expression and identification of new target RNA Polymerase II is shown. The lower expression of miR408-3p shows parallelism with the generation of healthy somatic embryos with applications for rapid screening of pluripotency in Oryza sativa. The online version of this article ( https://doi.org/10.1007/s11240-019-01602-w) contains supplementary material, which is available to authorized users. MS, AS and LIS grateful to DBT, GOI for research grant BT/PR11797/AGR/36/608/2009 and DST-FIST SR/FST/LSI-366/2008 Dt. 18.02.2009. MS thank CSIR-UGC India for providing SRF, AS thank UGC-BSR India for providing SRF. Mohammed Javed is gratefully acknowledged for helping in position weight matrix analysis. MS is the first author has performed the somatic embryo generation, qRT-PCR experiments, data analysis and has written the manuscript. AS is the second author has performed the regeneration experiments of somatic embryo and position weight matrix analysis. LIS has supervised the experiments and has corrected the manuscript.